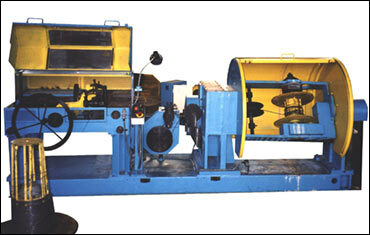 AUTOMATIC MACHINE FOR MAKING BARBED WIRE is designed for manufacture of dibasic barbed wire. * Presence of an extra drum for twisting two strings of wire makes it possible to prodyuse dibasic barbed wire of JOVA type. * The capacity and operating longevity have been extended by installation of drive shafts on rolling bearings. * The mechanism of length control makes it possible to reel a definite length of wire into bundle and switch the machine off in time. * Application of a sppecial twisting device allows for doing barbs twisting directly between the two strings. This fact provides rigid fixing of barbs along the base. unreelers for wire feed - 4.; cutting knives - 4. control cabinet - 1.